$4 of each ticket goes towards preventing Child Abuse in CT!!! 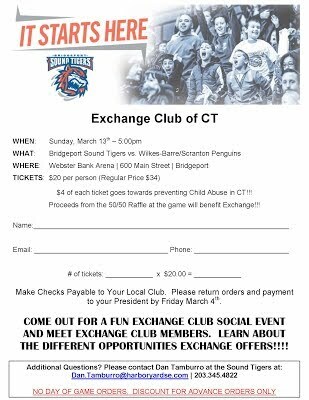 Proceeds from the 50/50 Raffle at the game will benefit Exchange!!! Make Checks Payable to Your Local Club. Please return orders and payment to your President by Friday March 4th. COME OUT FOR A FUN EXCHANGE CLUB SOCIAL EVENT AND MEET EXCHANGE CLUB MEMBERS. LEARN ABOUT THE DIFFERENT OPPORTUNITIES EXCHANGE OFFERS!!! !